Obama’s calling the mass influx of children illegally entering the U.S. an “urgent humanitarian situation” and that’s exactly what it is—Breitbart has the photos to prove it. The tens of thousands of children that are coming across the U.S.-Mexico border, many of whom from Central America, are unaccompanied. 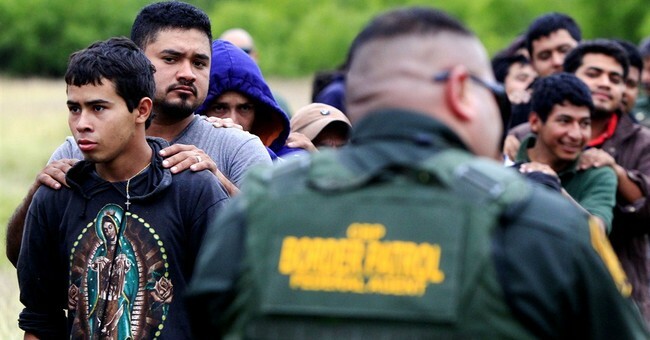 Officials are overwhelmed and sources tell filmmaker Dennis Michael Lynch that the Border Patrol in Texas is on the brink of collapse. Officials are trying to transport children to their illegal-immigrant family members already in the U.S., and parts of at least two military facilities are being used to house the children. But the photos Breitbart obtained show just exactly what that looks like. Republicans argue that the problem has undoubtedly gotten worse as the word has gotten out about the administration’s lax immigration enforcement policies. And they’re right. A mother and child told CHANNEL 5 NEWS that the message being disseminated in their country is, "go to America with your child, you won't be turned away." The woman said she wants a U.S. education for her daughter. Bercian Diaz said she has no family in the United States. Her hope of staying here relies on her little girl. She said the message in her country is that America's borders are open to all families. News reports in Guatemala say mothers and small children are getting bus tickets, Bercian Diaz said. "I said, ‘I need to act right now, because this will end and my girl won't have a future,'" Bercian Diaz said.